Muir College Council will be meeting every Thursday at 6:00 PM in Half Dome Lounge. Meetings are open to the public, so come in and say hi! Looking to Join Muir College Council? Interested in serving the Muir community? 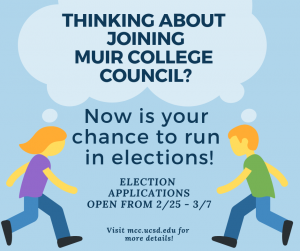 Become a part of Muir College Council! 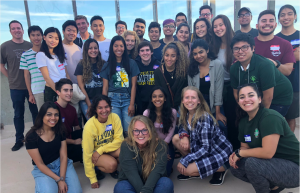 A link to this year’s election packet is available here. Several positions are open for Winter 2019. Visit the page Join Muir College Council for more details. Follow us on Facebook to stay updated on all the events and activities taking place across Muir! Roxy is a third year student majoring in Environmental Systems, and currently serves on MCC as the Vice President of External Affairs. She joined MCC last year, where she served as the Environmental Advocate. In her first term, she added decorated recycling bins into the residential halls, as well as solar umbrellas to the Muir Quad. Currently as VP of External Affairs, Roxy has ran the application and interview process for the past two quarters. She also runs the Initiatives Committee, which she has worked with to help make the El Portal Lounge feel more welcoming to commuters. Thanks for your great work Roxy! Application to join Muir College Council is now available.